Ideally located near the famous shops of the Champs-Elysees, between the 'Place de la Concorde' and 'Place de l'Etoile - Charles de Gaulle', the Elysees Hotel offers 24 comfortable rooms with private bathroom, satellite TV and electric beds. A high speed internet connection is available throughout the hotel. The Elysees Hotel offers 24 comfortable rooms with private bathroom with bathtub/shower and hairdryer, flat screen TV with satellite channels and Canal+, direct dial phone, air conditioning, safe and electric beds. Free Wi-Fi access is available throughout the hotel. 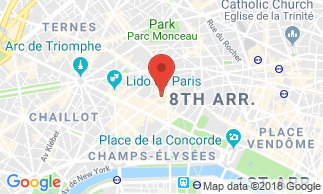 The Elysees Hotel is located less 5 minutes walk from the Champs-Elysees, halfway between the 'Place de la Concorde' and the 'Place de l'Etoile-Charles de Gaulle'. The metro station 'Franklin D. Rosevelt', located 300 metres from the hotel provides direct access to the Louvre Museum, the Gare de Lyon railway station and the business district of La Defense. Continental breakfast : 1 hot drink (tea, coffe or hot chocolate), 1 orange juice, 4 pastries (croissant, pain au chocolat, pain aux raisins and bread), 1 small cheese. Options: 1 omelette or boiled eggs, scrambled eggs or fried egg. It is served in the breakfast room from 7.30 am - 11 am, or in your room, from 7.30 am - 10.30 am (no extra charge). Breakfast is not included in the room rate : 15 EUR per person.